Caleb Fairly will ride for Giant-Alpecin next season, joining three other Americans on the WorldTour team. Giant already has Americans Lawson Craddock, Chad Haga, and Carter Jones in its 2015 lineup. 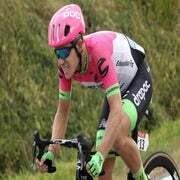 Craddock and Haga both joined Giant for 2014, while Jones arrives from Continental outfit Optum-Kelly Benefit Strategies. Fairly, 27, rode for Garmin-Sharp the last two years. In 2014, he primarily rode short stage races, like the Amgen Tour of California, Tour of Poland, Tour of Alberta, and the USA Pro Challenge. Fairly is a strong climber who will continue to serve as a domestique. Fairly placed sixth in the road race at the 2013 Volkswagen USA Cycling national championships. Fredrik Ludvigsson, 20, will join Fairly on the 2015 team. The Swede rode on the squad’s development team this year, and he raced at the UCI WorldTour level late in 2014. Ludvigsson finished fifth overall at Le Triptyque des Monts et Châteaux, seventh at Liège-Bastogne-Liège U23, and was the best young rider at the Circuit des Ardennes. He will officially join the team starting next year alongside older brother Tobias. Giant also re-signed Cheng Ji for the next two seasons after he became the first Chinese rider to compete in the Tour de France this year. Cheng has ridden for Giant since 2007, when the team was called Skil-Shimano. In 2014, the team was known as Giant-Shimano, and registered in the Netherlands. For 2015, it picked up a new sponsor and registered as a German team instead, though it will keep its Dutch headquarters. With this change, it will become the first German-registered WorldTour team since 2010.